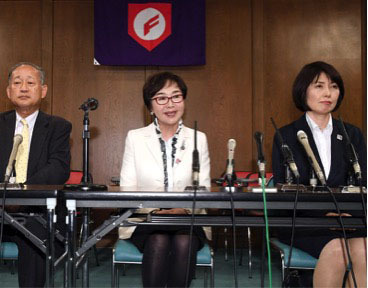 OSAKA -- The Japan High School Baseball Federation, commonly known as Koyaren, appointed its first female directors in its over 70-year history during a board meeting here on May 17. Chiyono Terada, 70, house mover Art Corp.'s president and vice chairperson of the Kansai Economic Federation, and Atsuko Ogasawara, 56, general manager of the Project Division at the Mainichi Newspapers' Osaka Head Office, have been named new directors of the 35-member board of Koyaren. Since the launch of its predecessor, the national secondary school baseball federation, in 1946, only men had occupied the seats of Koyaren directors. Terada told reporters at a news conference, "Problems that high school baseball are facing, such as the declining population of children, are also problems faced by society as a whole. I would like to voice my opinions as I learn (about high school baseball)." Koyaren Chairman Eiji Hatta said the organization appointed female directors to "get valuable feedback from women's perspectives and from those who don't have experience in baseball."